The kinetoplast DNA (kDNA) of trypanosomatids consists of an unusual arrangement of circular molecules catenated into a single network. The diameter of the isolated kDNA network is similar to that of the entire cell. However, within the kinetoplast matrix, the kDNA is highly condensed. Studies in Crithidia fasciculata showed that kinetoplast-associated proteins (KAPs) are capable of condensing the kDNA network. However, little is known about the KAPs of Trypanosoma cruzi, a parasitic protozoon that shows distinct patterns of kDNA condensation during their complex morphogenetic development. In epimastigotes and amastigotes (replicating forms) the kDNA fibers are tightly packed into a disk-shaped kinetoplast, whereas trypomastigotes (non-replicating) present a more relaxed kDNA organization contained within a rounded structure. It is still unclear how the compact kinetoplast disk of epimastigotes is converted into a globular structure in the infective trypomastigotes. In this work, we have analyzed KAP coding genes in trypanosomatid genomes and cloned and expressed two kinetoplast-associated proteins in T. cruzi: TcKAP4 and TcKAP6. Such small basic proteins are expressed in all developmental stages of the parasite, although present a differential distribution within the kinetoplasts of epimastigote, amastigote and trypomastigote forms. Several features of TcKAPs, such as their small size, basic nature and similarity with KAPs of C. fasciculata, are consistent with a role in DNA charge neutralization and condensation. Additionally, the differential distribution of KAPs in the kinetoplasts of distinct developmental stages of the parasite, indicate that the kDNA rearrangement that takes place during the T. cruzi differentiation process is accompanied by TcKAPs redistribution. Eukaryotic genomes are packaged into the nucleus by histones and non histone proteins. Histones are small, highly basic proteins that form a core around which the DNA is wrapped. Although chromatin is highly compacted, its structure is dynamic, allowing access to the DNA for processes such as replication, transcription, recombination and repair [1, 2]. Nucleoid-associated proteins have been described in archaea and bacteria. These proteins resemble eukaryotic histones in their DNA binding properties, low molecular weight, abundance and electrostatic charge. They organize and compact the prokaryotic genome and are involved in various processes, including gene expression [3, 4]. The proteins involved in DNA packaging in eukaryotic organelles have not been fully characterized. In the protozoa of the Trypanosomatidae family, the mitochondrial genome is contained within a specific region of the mitochondrion known as the kinetoplast. The kinetoplast DNA (kDNA) of trypanosomatids is organized into an unusual arrangement of circular molecules, catenated into a single network. Two types of DNA ring are present within the kinetoplast: maxicircles and minicircles. The maxicircles resemble the mitochondrial DNA of higher eukaryotes, encoding rRNAs and subunits of the respiratory complexes . The minicircles encode guide RNAs, which modify the maxicircle transcripts by extensive insertions and/or deletions of uridylate residues to form functional open reading frames, in a process known as RNA editing . The replication of kinetoplast DNA requires a repertoire of molecules, including type II topoisomerases, DNA polymerases, universal minicircle sequence binding proteins, primases and ribonucleases [7, 8]. The molecules involved in maintaining the highly ordered organization of kDNA in trypanosomatids remained unknown for many years. In 1965, Steinert suggested that the kinetoplast DNA was not associated with basic proteins . However, Souto-Padrón and De Souza provided cytochemical evidence that the kDNA of Trypanosoma cruzi was associated with basic proteins [10, 11]. They suggested that such proteins might be involved in neutralizing the negatively charged DNA molecules in close contact within the kinetoplast matrix. The proteins involved in kDNA organization were not biochemically or molecularly characterized until the 1990s, following the isolation of kinetoplast-associated proteins (KAPs) from Crithidia fasciculata . The KAPs of C. fasciculata characterized to date (CfKAP1, 2, 3 and 4) are small, highly basic proteins with a composition similar to that of the H1 histone, which contains lysine- and alanine-rich domains. These CfKAPs have a cleavable nine-amino acid presequence in their N-terminal region that is absent from mature forms and probably involved in kinetoplast import . CfKAPs have been shown to be exclusively restricted to the kinetoplast in immunolocalization assays and to bind to minicircles and condense the kDNA network in vitro [13, 14]. Several roles have been attributed to KAPs in C. fasciculata. They may facilitate the side-to-side association of individual strands of DNA through charge neutralization and influence the orientation of the kDNA to facilitate interaction with specific minicircle sequences [12–14]. 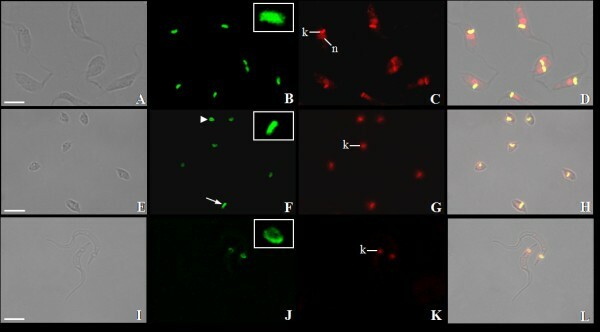 Further evidence of the involvement of KAPs in kDNA organization in vivo was obtained by disrupting both alleles of the KAP1 gene of C. fasciculata. The double-knockout mutant was viable, but presented substantial kDNA rearrangement, including a high level of kDNA fiber packaging and the appearance of a thicker layer in the middle of the kinetoplast disk . Surprisingly, this phenotypic modification was found to resemble the effects of treating C. fasciculata with topoisomerase II inhibitors . The inability of KAPs 2, 3 and 4 to complement KAP1 function in kDNA organization is consistent with KAP1 having a role different from that of other KAPs. Indeed, KAP 2 and 3 are involved in mitochondrial metabolism rather than kDNA organization, as disruption of both alleles of the KAP 2 and 3 genes increases the levels of several mitochondrial mRNAs, reduces respiration rate and interferes with cell growth and morphology . Despite some efforts to identify kinetoplast-associated proteins in T. cruzi, little is known about KAPs in this protozoon [18, 19]. T. cruzi is the etiologic agent of Chagas disease and passes through several developmental stages during its life cycle. Epimastigotes and amastigotes are the proliferative forms found in the insect host midgut and mammalian cells, respectively, whereas trypomastigotes are the non proliferative forms infecting the vertebrate host . The differentiation of epimastigotes into trypomastigotes involves morphological changes, including kDNA rearrangement. In the epimastigote and amastigote forms of T. cruzi, as in most trypanosomatids, the kDNA fibers are tightly packed into a compact disk-shaped structure. Conversely, trypomastigotes have a rounded kinetoplast, with a more relaxed organization of kDNA . The conversion of the kinetoplast disk into a globular structure probably involves a mechanism controlling the type of KAPs associated with the kDNA or the extent to which these proteins associate with the DNA network at different stages of parasite development. In this work, we have analyzed KAP coding sequences in trypanosomatid genomes, organized them by means of phylogenetic and syntenic analyses and defined two KAP proteins distinct from those originally described in C. fasciculata. In addition, two kinetoplast-associated proteins of T. cruzi, TcKAP4 and TcKAP6, were cloned, expressed and antisera were generated against recombinant proteins. Imunolabeling assays revealed a differential distribution of TcKAPs in the kinetoplast of distinct developmental stages of the parasite. Epimastigote forms of T. cruzi (Dm28c clone)  were grown in liver infusion tryptose (LIT) medium supplemented with 10% fetal calf serum at 28°C. Bloodstream trypomastigote forms derived from the blood of Swiss mice were used to infect the LLC-MK2 cells. Trypomastigotes were released seven days after infection in the supernatant and purified by centrifugation. Amastigotes were obtained by disruption of the LLC-MK2 cells after four days of infection with trypomastigotes. It is worth mentioning that the amastigotes released after disruption of the cells are mixed with intermediate forms, which represent a transitional stage between amastigotes and trypomastigotes . DNA was extracted as described by Medina-Acosta and Cross . The CfKAPs1–4 protein sequences were retrieved from GenBank®  and a BLASTp search  was performed against all protein sequences from trypanosomatids with a complete sequenced genome, available in GenBank® (release 169). All hits having an e-value lower than 1e10-5 were selected for further analyses. Sequences that were redundant or did not contain a discernible nine amino acids presequence, suggestive of kinetoplast import, were discarded. Primers were designed to amplify the entire coding region of these genes from the T. cruzi Dm28c genome. Primers TcKAP4-F (from nucleotide 1 to 29) (5' GGGGGATCC ATGCTCCGCTTTTGTCGGTCTCGCCTCGC 3') and TcKAP4-R (from nucleotide 356 to 384) (5' GGGGTCGAC TTAAGTCTTTTTCTTCTTTGGCTGCTGCT 3') were constructed based on the sequence with GenBank ID XM_801968 and used to amplify the TcKAP4 coding region, whereas the sequence with GenBank ID XM_810849 was used to design the primers TcKAP6-F (from nucleotide 1 to 21) (5' GCGGGATCC ATGCTTCGCGTCTCCCTGCTT 3') and TcKAP6-R (from nucleotide 531 to 558) (5' GGGGTCGAC TCACACCTTGCTACGTGTGATCTTCTTG 3') for PCR amplification of the TcKAP6 coding region. The forward primers contain Bam HI sites whereas the reverse primers contain Sal I sites (bold sequences). PCR was carried out in the following reaction mixture: 10 pmol of each pair of primers, 100 ng of T. cruzi genomic DNA, 200 μM dNTPs, 1.5 mM MgCl2, 20 mM Tris-HCl, pH 8.4, 50 mM KCl and 2.5 units of Taq DNA polymerase (Invitrogen). Reactions were carried out in a GeneAmp PCR System 9700 (Applied Biosystems) thermal cycler, with an initial denaturation at 94°C for 4 min, followed by 30 cycles of 94°C for 30 s, 58°C for 30 s and 72°C for 30 s. We obtained an amplified product of 0.4 kb for TcKAP4 and 0.65 kb for TcKAP6. The PCR products were purified with a high-purity PCR product purification kit (Roche), digested with Bam HI and Sal I and inserted into the pQE30 expression vector (QIAGEN). The His6-tagged recombinant proteins were produced in the E. coli M15 strain following induction with 1 mM IPTG (isopropyl-1-thio-β-D-galactopyranoside) and culture for an additional 3 h at 37°C. The recombinant proteins were largely insoluble and were obtained from the inclusion bodies. The pellets of cultures of E. coli expressing TcKAP4 or TcKAP6 (250 ml) were resuspended in 10 ml of 20 mM Tris HCl, pH 8.0, 0.5 M NaCl and subjected to five pulses of sonication for 10 s each at 4°C (Cole Parmer 4710). The sonicated extracts of E. coli were centrifuged at 12,000 × g for 10 min at 4°C. The supernatant was discarded and the pellets containing the inclusion bodies were washed three times in 50 mM Tris-HCl, pH 8.0, 0.5 M NaCl, 2% Triton X-100, resuspended in 4 ml of the protein sample buffer for SDS-PAGE (Sodium Dodecyl Sulfate Polyacrylamide Gel Electrophoresis) and resolved in 15% polyacrylamide gels (20 cm × 20 cm × 0.4 cm) at 20 volts for 16 h at room temperature. After electrophoresis, the gels were incubated in cold KCl (100 mM) for 30 min to visualize the bands of proteins. The recombinant protein bands were excised from the gels, electroeluted in a dialysis bag at 60 V for 2 h in SDS-PAGE buffer and dialyzed against PBS (10 mM sodium phosphate buffer, 150 mM NaCl), pH 8.0. Polyclonal antisera against the recombinant proteins were produced in mice. The animals were immunized by intraperitoneal injection with 100 μg of the appropriate antigen in Freund's complete adjuvant (Sigma) for the first inoculation and with 20 μg of the recombinant protein with Freund's incomplete adjuvant (Sigma) for three booster injections at two-week intervals. Antisera were obtained five days after the last booster injection. For immunoblotting analysis, cell lysates (1 × 107 parasites) were separated by SDS-PAGE in 15% polyacrylamide gels and the protein bands were transferred onto a nitrocellulose membrane (Hybond C, Amersham Biosciences) according to standard protocols . Nonspecific binding sites were blocked by incubating the membrane with 5% nonfat milk powder and 0.1% Tween-20 in PBS, pH 8.0 for 30 min. Membranes were then incubated for 1 h with the polyclonal antiserum raised against the recombinant protein (TcKAP4 or TcKAP6) diluted 1:500 in blocking solution. The membrane was washed three times in PBS and then incubated for 45 min with alkaline phosphatase-conjugated anti-mouse IgG secondary antibody (Sigma) diluted 1:10,000 in blocking solution. Bound antibodies were detected with the BCIP (5-bromo-4-chloro-3-indolyl-phosphate)/NBT (nitro blue tetrazolium) solution kit (Promega). The pre immune sera were also tested, as described above. The antibody anti-polyhistidine (Sigma) was diluted 1:3,000 in blocking solution and used to confirm the expression of TcKAPs in E. coli M15 strain. The parasites were washed in PBS, pH 8.0 and fixed by incubation with 4% freshly prepared formaldehyde in PBS for 30 min. Cells were deposited on poly-L-lysine-treated microscope slides and permeabilized by incubation with 0.5% Triton X-100 in PBS, pH 8.0, for 5 min. The slides were incubated in blocking solution containing 1.5% BSA, 0.5% teleostean gelatin, 0.02% Tween 20 in PBS, pH 8.0 and were then incubated with anti-TcKAP4 or anti-TcKAP6 antiserum diluted 1:80 in blocking solution for 1 h. The parasites were washed and incubated with Alexa Fluor® 488 goat anti-mouse IgG (Molecular Probes) diluted 1:500 in blocking solution for 45 min. The pre immune sera were also tested, as described above. The slides were mounted in N-propyl gallate and visualized by confocal laser scanning microscope (Zeiss LSM510 META). For control assays, the incubation with anti-TcKAP4 or anti-TcKAP6 was omitted. Protozoa were fixed in 2.5% glutaraldehyde diluted in 0.1 M cacodylate buffer, pH 7.2, for 2 h at room temperature and post-fixed in 0.1 M cacodylate buffer containing 1% OsO4, 5 mM calcium chloride and 0.8% potassium ferricyanide for 1 h. Then, cells were dehydrated in a graded series of acetone and embedded in Epoxy resin. Ultrathin sections were stained with uranyl acetate and lead citrate and observed in a Zeiss 900 transmission electron microscope. The parasites were fixed in 0.3% glutaraldehyde, 4% formaldehyde and 1% picric acid diluted in 0.1 M cacodylate buffer, pH 7.2 and then dehydrated at -20°C in a graded series of ethanol solutions. The material was progressively infiltrated with Unicryl at lower temperatures and resin polymerization was carried out in BEEM capsules at -20°C for 5 days, under ultraviolet light. Ultrathin sections were obtained with a Leica ultramicrotome (Reichert Ultracuts) and grids containing the sections were incubated with 50 mM NH4Cl for 30 min. They were then incubated with blocking solution (3% BSA, 0.5% teleostean gelatin diluted in PBS, pH 8.0) for 30 min, followed by incubation with anti-TcKAP4 or anti-TcKAP6 antiserum diluted 1:100 in blocking solution for 1 h. The grids were then incubated for 30 min with gold-labeled goat anti-mouse IgG (Sigma) diluted 1:200 in blocking solution, washed and stained with uranyl acetate and lead citrate for further observation in a Zeiss 900 transmission electron microscope. For control assays, incubation with the primary antiserum was omitted. As previously stated, originally five distinct kinetoplast-associated proteins were described in C. fasciculata, named CfKAP1–5 [12, 13]. However, the CfKAP5, also designated p15, was never characterized. Since little is known about kDNA-associated proteins in T. cruzi [18, 19] and other trypanosomatids, we sought initially to address this problem by examining genome database of the T. cruzi , T. brucei , Leishmania major , L. infantum and L. braziliensis . In a BLASTp search, using as query the available CfKAP protein sequences, we have identified 35 protein sequences related to CfKAPs: 11 in T. cruzi; 7 in L. braziliensis; 6 in L. major and L. infantum; and 5 in T. brucei. A phylogenetic analysis including these 35 sequences and the five CfKAPs used as query was performed, in order to construct a phylogenetic tree (figure 1). Additionally, a synteny conservation analysis was performed, where chromosome location was highly correlated with tree topology, allowing us to infer the homology relationships between the trypanosomatid KAPs [see additional file 1]. Phylogenetic analysis of trypanosomatid KAPs proteins with confidence values shown as percentages. Lb, Leishmania braziliensis; Li, Leishmania infantum; Lm, Leishmania major; Tb, Trypanosoma brucei; Tc, Trypanosoma cruzi. In the T. cruzi genome, we were able to identify the KAP3 and KAP4 genes, but not the KAP1 and KAP2 genes, which were only identified in Leishmania spp. and C. fasciculata. Furthermore, we were able to identify two other genes that are similar to the CfKAPs, herein named KAP6 and KAP7. They have not been characterized in Crithidia, as the available sequence information for this genome is limited (227 nucleotide sequences in the current version of GenBank). The KAP6 gene whose size is compatible to others KAPs, is more related to KAP4 (figure 1) and was annotated in all five genomes analyzed as "kinetoplast DNA-associated protein". The KAP7 gene, also present in all trypanosomatid genomes, has been annotated as "hypothetical protein, conserved". Although it is clustered with the KAP1 gene (figure 1), the lower bootstrap value of this clade reinforces the uncertainty of KAP7 relationship to other KAPs. The KAP genes of T. cruzi are present as two copies, with the exception of TcKAP4c, probably due to the hybrid nature of the CL Brener strain - [see additional file 1]. In this work, we cloned and expressed two KAPs in T. cruzi: TcKAP4 and TcKAP6. The PCR amplification of the TcKAP4a gene generated a 387 bp DNA fragment encoding a protein with a predicted molecular weight of 14.5 kDa. The deduced amino acid sequence of the protein encoded by the TcKAP4 gene includes 28% basic residues, with a predicted pI of 14.5. The TcKAP6 gene is 558 base pairs long and encodes a polypeptide with a predicted molecular weight of 21.2 kDa. The amino acid sequence of TcKAP6 includes 30% of basic residues and this protein has a predicted pI of 11.3. The amino acid sequence data reported here are available from GenBank under the accession numbers ABR15473 for TcKAP4 and ABR15474 for TcKAP6. Both TcKAP4 and TcKAP6 have a clearly identifiable cleavable presequence in the N-terminal region similar to that described for the KAPs of C. fasciculata and potentially involved in mitochondrial import (figure 2). These presequences are absent from the mature forms of the proteins in C. fasciculata and with the exception of their length, have all the properties usually associated with cleavable mitochondrial presequences [12–14]. Similar sequences have been identified in the C. fasciculata kinetoplast DNA polymerase beta, T. brucei hsp60 and Leishmania tarentolae aldehyde dehydrogenase [38–40]. Comparison of N-terminal sequences of KAPs from C. fasciculata and T. cruzi. The presequences predicted to be involved in kinetoplast import are shown in bold type. The boxes indicate the highly conserved amino acids. Note that all sequences begin with the sequence M, L, R. In all sequences other than those of CfKAP4 and TcKAP4, the fifth amino acid is hydroxylated and the ninth is generally hydrophobic. CfKAP4 (PIR JC6092), CfKAP3 (GenBank accession number AY143553), CfKAP2 (GenBank accession numbers AF008943 and AF008944) and CfKAP1 (GenBank accession number AF034951) are KAPs from C. fasciculata whereas TcKAP4 (GenBank accession number ABR15473) and TcKAP6 (GenBank accession number ABR15474) are T. cruzi KAPs. As reported for their counterparts in C. fasciculata [12, 13], the TcKAPs are positively charged and small, consistent with a role in DNA charge neutralization and kDNA condensation in T. cruzi. The interaction between KAPs and kDNA may involve nonspecific electrostatic binding to DNA, interaction with specific regions of the minicircles or both types of association. However, further studies are required to investigate the occurrence of interaction between TcKAPs and kDNA, and how these interactions determine DNA network organization in T. cruzi. After cloning and expression, recombinant TcKap4 and TcKap6 proteins (figure 3) were purified in order to produce mouse polyclonal antisera against them. These antisera were used in immunoblotting assays, to analyze the expression of TCKAPs in proliferative and non proliferative stages of T. cuzi. Cell extracts of epimastigotes, amastigotes/intermediate forms and trypomastigotes were used and both antisera were able to detect a single polypeptide in all developmental stages of T. cruzi. 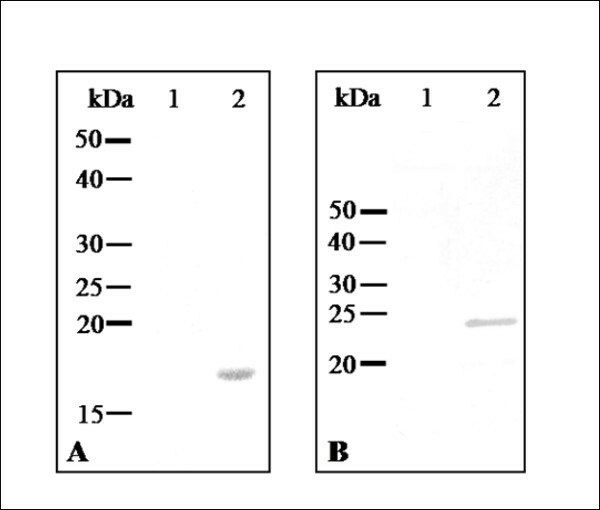 The anti-TcKap4 serum detected a protein with an apparent molecular weight of 16 kDa (figure 4A) and the anti-TcKap6 serum detected a protein with an apparent molecular weight of 22 kDa (figure 4B). The molecular weights observed on SDS-PAGE were slightly higher than those expected based on the deduced amino acid sequences of TcKap4 and TcKap6. This difference may result from the basic nature of these proteins. Expression of recombinant TcKAPs in E. coli. The TcKAP4 (A) and TcKAP6 (B) were expressed in E. coli M15 strain following induction with 1 mM IPTG for 3 h. Immunoblotting assays of non-induced (1) and induced (2) bacterial extract using anti-polyhistidine antibody confirmed the expression of recombinant TcKAPs. Detection of TcKAPs in T. cruzi. 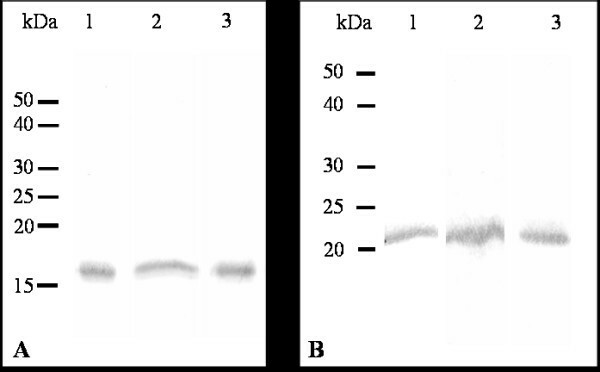 Western blot analyses of (1) epimastigote, (2) amastigote/intermediate form and (3) trypomastigote extracts of T. cruzi, using anti-TcKAP4 (A) or anti-TcKAP6 (B) serum. Both antisera recognized a single polypeptide in all developmental stages of the parasite. The TcKAP antisera were also employed to determine the subcellular location of TcKAPs in T. cruzi. It is worth mentioning that the kinetoplast of this parasite undergoes morphological changes during the protozoon life cycle; epimastigotes and amastigotes have tightly packed kDNA fibers condensed within the kinetoplast disk, whereas trypomastigotes have a more relaxed organization of kDNA, which is enclosed in a rounded structure. During the transformation of amastigotes in trypomastigotes inside the mammalian cell, changes occur in the general organization of the protozoa, in special in the kinetoplast structure. The population of intracellular parasites does not differentiate in perfect synchrony, thus at a certain time of the differentiation process, some transitional stages between amastigotes and trypomastigotes can be found in the same cell . For this reason, the amastigotes used in our assays, which were released after disruption of LLC-MK2 cells, were mixed with intermediate forms. The kinetoplast of these intermediate forms is enlarged in relation to the disk observed in amastigotes, presenting the DNA fibers densely packed in the central area, but less condensed at the periphery. In order to analyze the distribution of TcKAPs in all developmental stages of T. cruzi, we carried out immunolabelling assays using TcKAP antisera in epimastigotes, amastigotes/intermediate forms and trypomastigotes. Both antisera specifically recognized the kinetoplast of all developmental stages of T. cruzi (figures 5 and 6). However, the distribution of these proteins within the kinetoplast depended on the developmental form of the parasite. In epimastigotas and amastigotes, TcKap4 and TcKap6 were distributed throughout the kDNA network (figures 5A–H for TcKAP4 and 6A–H for TcKAP6), consistent with findings for C. fasciculata, in which CfKAPs are distributed for all kinetoplast disk [13, 14]. In intermediate forms (figures 5F and 6F, arrowheads) and trypomastigotes (figures 5 and 6I–L), TcKap4 and TcKap6 were distributed mainly at the periphery of the kDNA network. In order to better understand the kDNA arrangement present in the intermediate forms and the distribution of KAPs in the different developmental stages of T. cruzi, ultrastructural analyses and immunocytochemistry assays were performed (figure 7). In epimastigotes and amastigotes (figure 7A and 7D, respectively), which present a disk-shaped kinetoplast, we could observe gold particles distributed throughout the kinetoplast disk when both antisera were used (figure 7B and 7E for TcKAP4 and 7C and 7F for TcKAP6). In intermediate forms, which present an enlarged kinetoplast when compared to the disk-shaped kinetoplast of amastigotes (figure 7G), labeling of TcKAPs is more intense at the peripheral region than in the central area (figure 7H and 7I). 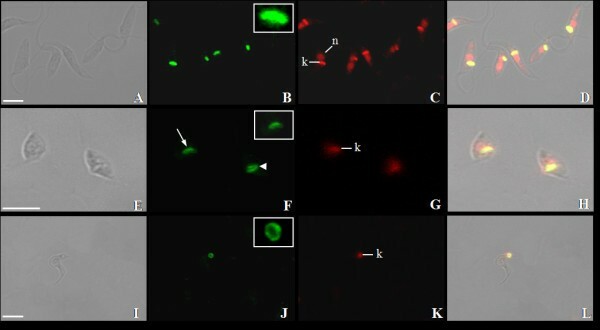 In trypomastigotes, which present a round-shaped kinetoplast (figure 7J), gold particles were mainly observed at the periphery of the kinetoplast network (figure 7K and 7L), confirming the results obtained by immunofluorescence analysis. Preliminary cytochemical studies had already shown different distributions of basic proteins in the kinetoplasts of the different developmental stages of T. cruzi . However, the reason for this differential protein distribution remain unclear. It is possible that these basic proteins are involved in topological rearrangements of the kDNA network during the T. cruzi life cycle, in which the compact bar-shaped kinetoplast is converted into a globular structure. However, no data are currently available to confirm or refute this hypothesis. Distribution of TcKAP4 in T. cruzi. Immunolocalization of TcKAP4 in epimastigotes (A-D), amastigotes/intermediate forms (E-H) and trypomastigotes (I-L) of T. cruzi. In epimastigotes (B) and amastigotes (F-arrow), the protein is distributed throughout the kDNA disk (insets). In intermediate forms (F-arrowhead) and trypomastigotes (J-inset), a peripheral labeling of the kinetoplast was observed. (A-E-I) Phase-contrast image, (B-F-J) fluorescence image using anti-TcKAP4 serum, (C-G-K) propidium iodide showing the nucleus (n) and the kinetoplast (k), and (D-H-L) the overlay image. Bars = 5 μm. Distribution of TcKAP6 in T. cruzi. Immunolocalization of TcKAP6 in epimastigotes (A-D), amastigotes/intermediates forms (E-H) and trypomastigotes (I-L) of T. cruzi. As observed for TcKAP4, this protein was also distributed throughout kDNA disk in epimastigotes (B-inset) and amastigotes (F-arrow and inset), and at the periphery of the kinetoplast in intermediate forms (F-arrowhead) and trypomastigotes (J-inset). (A-E-I) Phase-contrast image, (B-F-J) location of TcKAP6 in the kinetoplasts of T. cruzi, (C-G-K) iodide propidium labeling and (D-H-L) the overlay image. k = kinetoplast, n = nucleus. Bars = 5 μm. Ultrastructural localization of TcKAPs by transmission electron microscopy. 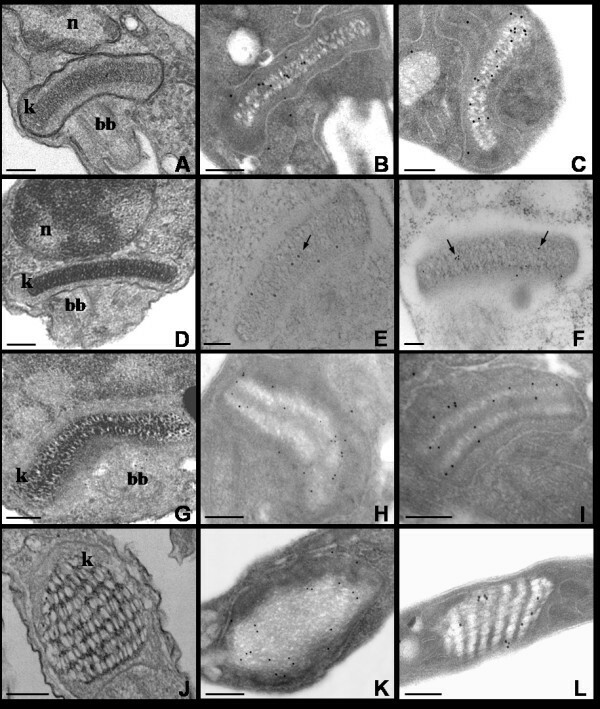 A-D-G-J: ultrastructural analyses of the kinetoplast in the different developmental stages of T. cruzi. The kinetoplast of intermediate forms (G) is larger than the bar-shaped kinetoplast of epimastigotes (A) and amastigotes (D). The trypomastigotes (J) present a more relaxed kDNA organization, contained within a rounded kinetoplast. TcKAP4 (B-E-H-K) was distributed throughout the kinetoplast DNA network in epimatigotes (B) and amastigotes (E-arrow). In intermediate forms (H) and in trypomastigotes (K), TcKAP4 was distributed mainly at the periphery of the kDNA. The same result was observed for TcKAP6 (C-F-I-L). A homogenous distribution for all kinetoplast was observed in epimastigotes (C) and amastigotes (F-arrows), while a more peripherical distribution was seen in intermediate forms (I) and trypomastigotes (L). Bars = 0.25 μm. k = kinetoplast, n = nucleus, bb = basal body. In this work we showed for the first time that the distribution of TcKAPs in different developmental stages of T. cruzi is related to the kinetoplast format: in disk-shaped structures, like those found in epimastigotes and amastigotes, proteins are seen dispersed through the kDNA network. Conversely, in intermediate and rounded kinetoplasts, like those observed in intermediate forms and trypomastigotes, KAPs are mainly located at the kDNA periphery. Taken together, these data indicate that the kDNA rearrangement that takes place during the T. cruzi differentiation process, is accompanied by TcKAP4 and TcKAP6 redistribution within the kinetoplast. It means that TcKAPs could determine, at least in part, the distinct topological organization of the kDNA networks. Although much information is available concerning the kinetoplast-associated proteins in C. fasciculata, it is still unknown how KAPs and other proteins interact with the DNA molecules to condense and determine the tridimensional arrangement of the kDNA network in trypanosomatids. Further studies using gene knockout to inhibit the expression of KAPs or assays to over-express these proteins, would help us understand the biological function of TcKAPs in T. cruzi and their involvement (or not) in the topological rearrangements of kDNA during the parasite morphogenetic development. TcKAPs are candidate proteins for kDNA packaging and organization in T. cruzi. The trypanosomatid genomes sequenced to date have several sequences that share some degree of similarity with CfKAPs studied so far (CfKAP1–4). We have organized these sequences according to coding and syntenic information and have identified two potentially novel KAPs in these organisms, KAP6 and KAP7. Additionally, we have characterized two KAPs in T. cruzi, TcKAP4 and TcKAP6, which are small and basic proteins that are expressed in proliferative and non-proliferative stages of the parasite. TcKAPs present differential distribution within the kinetoplasts of epimastigotes, amastigotes, intermediate forms and trypomastigotes, indicating that the kDNA rearrangement that takes place during the T. cruzi differentiation process is accompanied by TcKAPs redistribution. We would like to thank Bernardo Pascarelli and Emile Barrias for technical assistance. We also thank the Program for Technological Development in Tools for Health-PDTIS-FIOCRUZ for the use of its facilities. This investigation received financial support from Conselho Nacional de Desenvolvimento Científico e Tecnológico (CNPq) and Fundação Carlos Chagas Filho de Amparo à Pesquisa do Estado do Rio de Janeiro (FAPERJ). DPC carried out the experiments and wrote the manuscript. MKS helped to produce the mouse polyclonal antisera. 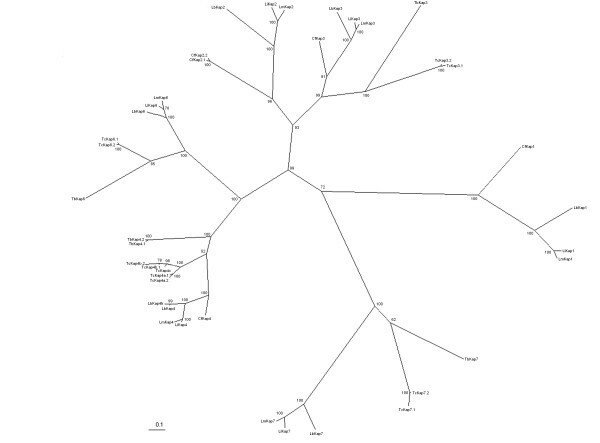 CMP performed the phylogenetic and bioinformatic analysis. TCBSSP provided amastigotes and helped to analyze the results of the imunolabeling assays. WS and SG helped to analyze the results and revised the manuscript. SPF participated in the design and coordination of the study and helped to revise the manuscript. MCMM conceived the study and critically analyzed the paper content. All authors read and approved the final manuscript.